Author: Halpern, Adena Set In . . . Description: What if you closed your eyes, blew out the candles, and your wish came true? Ellie Jerome is a young-at-heart seventy-five-year-old who feels she has more in common with her twenty-nine-year-old granddaughter, Lucy, than her fifty-five-year-old daughter, Barbara. Ellie’s done everything she can to stay young, and the last thing she wants is to celebrate another birthday. 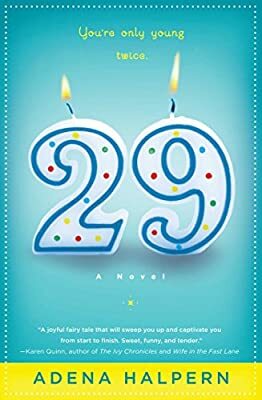 So when she finds herself confronted with a cake full of candles, Ellie wishes more than anything that she could be twenty-nine again, just for one day. But who expects a wish like that to come true? 29 is the story of three generations of women and how one magical day shakes up everything they know about each other. While Ellie finds that the life of a twenty-something is not as carefree as she expected, the sheer joy of being young again prompts her to consider living her life all over. Does she dare stay young for more than this day, even if it means leaving everyone she loves behind? Fresh, funny, and delightful, 29 is an enchanting adventure about families, love, and the real lessons of youth.